Super Hero Boy: Bring the magic of Build a Bear home! Bring the magic of Build a Bear home! So you've gone to Build a Bear and built your bear. They have had their clothes changed how many times by now? Well now what? heh. Build A Bear Workshop on DS offers the magic of build a bear with far more things to do! Just like the real thing, you get to pick out your own bear in the DS game. You pick the stuffed animal (bear, dog, monkey, ect), the clothing, and you even get to name your new creation. Once you have your new friend made the fun begins. You can earn new outfits, dance moves, and accessories. You do this by playing mini games, my favorite of which is the cooking game as it reminds me a lot of the cooking game I play through one of those online game play sites. Along with the cooking game there is a dance game that is sort of a simon says, the game shows you a shape then you draw it correctly, a common type of control for DS's that honestly I am horrible at. Needless to say I loved the game especially its simple controls and easy mini games, as this game is ment for children under 12 (though I'd really say its perfect for the 4-7 range) the only real issue with it as all the directions for the games is in text. Though I'm fairly positive a three or four year old could master at least some of the games the reading would be an issue. So, I would highly recommend that parents play the games through with their kids at least once if they cannot read the directions. Once they understand how to play though, I'll bet you'll have a hard time tearing them from it! If your kid has friends with the same game they can link up through wifi and share outfits, photos and more. 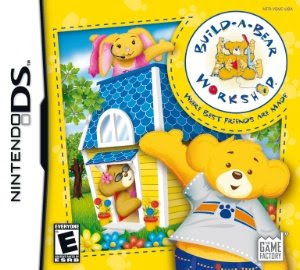 You can learn more about Build A Bear Workshop on DS on The Game Factory website! Build A Bear Workshop for DS is available right now on Amazon! 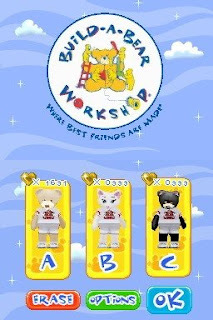 I have one copy of Build A Bear Workshop to give away to one lucky reader! Leave a comment on this post. Check out Build A Bear Workshop and tell me what is most exciting to you about this game! I love how interactive this is. Not only do you build your bear/animal, but you can do other things for it. I love the cooking-mama-like game! Can't wait for the Wii version of Build-A-Bear this fall! I love that you can make your own furry friend. I also love that you can cook for them. My favorite thing about this game is the fact you don't have to go to the store at the mall and pay for each new animal, LOL. What a neat Idea for a game! I love the idea of building a bear! Wow! The first to comment! How exciting! We love to go to Build a Bear, The kids would enjoy playing a game about one of their favorite stores. Thjis looks great because they love bab ws here but it gets expensive- this way they can create and create until they pass out or get bored and it would be pasing out. This looks like alot of creative fun that is clean. I really like the idea of it having the mini games. Gracie likes the mini games in her Mario game. So, I think this would make her happy. Your button is on my sidebar. Thanks for the extra chance. That my kids can make bears without me having to buy them all! The most amazing thing-my daughter is begging for this video game and she never wants games. This looks great! I love it that you can cook for them. Nice prize. My 9 year old niece would just love this for her DS! I love that you can make a frog. Frogs are very big at my house! I would love to get this for my daughter. She has only been to Build A Bear Workshop once & she loved it. She has a pink DS & could use a new game! This game excited me not only because we are big build a bear fans, but that it has so many aspects of the real store like being able to choose and create your animal! My kids love their Build-A-Bear creations, it sounds like they would love this game as well. It is so interactive. I am sure my daughter would be excited about changing the outfits and the dance moves. Want the cooking like mama game ! My girls love Build-A-Bear and Cooking Mama, so the game like that is the best! Honestly, I am excited because it might help my little one draw shapes better, and she loves build a bear, its a win win situation! I have your button in my sidebar! I love that it is interactive. My daughter loves stuffed animals, so I know she would love this! There are lots of things I love about this game!!! It's a familiar concept for kids who have been to Build-A-Bear, and I really like how much of the store is part of the game. It seems to be very interactive, which I love, and the mini games sounds like a great idea, too. It's also so colorful, and I think that kids will be drawn to the colors, the animals, getting to care for the animal they choose, and the idea of having a game to go along with their animal from BAB. I'm excited about this game because the kiddos can build lots of different bears for themselves without having to find a place to sit them. I'm already overrun with stuffed animals. I love that you can make your own bears over and over again! theres no death or violence. its a good game. thanx!! My grandchildren love Build-a-Bear; this would give them the opportunity to "Buiid-A-Bear more often! Thank you! My granddaughter would just love this. She loves the Build a Bear shops. It's about time!! My kids are going to love it. My daughter will be changing the clothes constantly. I like the idea of being able to choose something other than a bear. Thanks for the contest. I like the fact that it looks not so simple that the kids will be bored by it, and that it's rated E, so I won't worry about the content. Thanks for the contest! I love that there's so many interactive features. It looks so cute & fun. I love the frog and turtle! We love Build a Bear. That you can make your own stuffed animal. Thank you for having this. I like the game is so interactive and you can choose any character. Thank you my 3 children would love this. Thank you! My son loves buildabear he plays on the online site alot. We don't have a Build A BEar Workshop here, so this is the closest my three girls could get! All the choices they can make! To be honest, the best part about this game is that you don't have to go to the store. My daughter would love taking care of the bear after creating it. Thanks for the great contest! I love that this is an easy to play game. It seems like far too often we buy games that are just too advanced (right now anyways) for my seven year old to even play. I am definitely going to have to look into getting this game as a Christmas present if we don't win. Thanks for the great review! My son just made his first Build A Bear the other day. He is so excited by him. Winning this would enable him to bring the bear to life in a way and I know he would love that. I love that it is interactive...and that it comes from a store/activity that my kids love and have always loved!!! THANKS!!! Hi again...am a subscriber...thanks for extra entry! I like that its not just building an animal friend,you also get to play many different games! Thanks! I love the new build a bear site! I dont think my kids realize how interactive it is now that it's different : O They are So going to want to get a new bear now!! It looks like we all could use it. The different characters and the way you can dress them up and change them, this sounds like fun, even for me!!! I like that you can earn honey nuggets to buy more accessories. Also the characters are so cute. What excites me most about this game is how happy it would make my daughter!! I love the fact that this would probably be one of those super addictive games you couldn't put down for a while. I think I'd like to build a "playful puppy" since I don't have a real one to play with! Love that it is an interactive game. Thanx for the contest. I like how the game can teach the children responsibility since you can care for the bears by cooking for them. I like that you can cook for your bears because my son loves cooking games! You can email me thru my blog! Being able to build a bear whenever the mood strikes. This looks so fun. I like how it teaches responsibility! My daughter likes doing things on her own! grandaughter loves the care bears and also she is of the age where it is time to learn responsibility!! I think the Build a Bear game is darling - I really like the feature that you can change their clothes! I need a new DS game, the one I have is getting pretty boring. I am obsessed with build a bear! I love it that they make new bears from High School Musical! Thanks for the giveaway! My dd is an aspiring photographer and will get the biggest kick out of the photo studio area! I love that it is so interactive. I would hope that my kids would get some ideas of what animals and outfits they would want before going to one of their mall stores -- choosing takes so much time and effort! My daughter Cassandra would love build-a-bear game. She is the only girl in the house and begs to go there. We don't have the money as we spend it for our autistic son's programs. This game looks so cute. I like that kids can link up with their friends. And all the different wardrobe options for the bears is adorable, I may check it out myself. dressing them up is the most fun. It truly sounds like an awesome game. My granddaughter would love to prepare meals and feed her bear. Plus the 8 characters sound really cute. Thank you! My daughters love taking care of virtual pets, but they are always online. It would be fun for them to be able to play without being on the computer. Cool game + they love build a bear! Watching my daughter's face as she dresses the bears on the game as she does in real life. I love that you can make your own bear and then take care of it. Wow you can play Build a bear online. That sounds great. Thanks. it is just too cute! My kids will love it! I love how the game is good clean fun for the whole family! It is great how you can both create the bears and then take care of them. The nurturing tools of actually caring for the bear are great. This game is almost like being in the store Build a bear you do everything you do in the store! Love it and so does my daughter! Both of my daughters love Build-a-Bear. They would love this. Being able to care for them would be especially nice. I like that once you make the friend you can interact with it! I love these types of game...make and take care of your own doll...how cute. You can have 3 characters, so one of the games could be mine on there! I need games that would be simple enought for a 3 year old, because when its video game time, my daughter gets frustrated because everyone (even hubby plays games) plays cool games but her. I would love to play this with her. I like that kids can create the bears. My kids love build a bear and would love to have this game. This sounds like a really fun game. Please enter me. My 5 year old always wants to play my DS but I don't think most of the games are age appropriate - this one is! Plus she loves build a bear! I like how the game is less expensive than an actual build a bear, plus you can have more than one of them! It's exciting to be able to play with my creative side. i like how you get to "Make your own furry friend", just like the toys! I am most excited that my cousins are all older except for one and this is a perfect age appropriate game he can play and be cool like his brothers. I like that you can Cook a series of meal and feed your Bear using a fully equipped kitchen and dining room. I think this game is great, because your child has to care for the character and there is no violence! Thanks! I think I love Build a Bear as much as my kids do! that they can build all sorts of animals, too cute! We love how you can create and interact, then if your friendshave it too you can swap. Oh how this would thrill my great granddaughter, to make her own bears wow. My oldest daughter would love this. She loves the Build a Bear store and this would save me some money going there all the time. I liked the mini-games. Especailly the one where they draw the shapes. Looks like fun. I like that you can make your own bear and take care of it. My daughters would love this game! I would get to cook meals for my buddies?! That rocks. My daughter loves to play games on her DS where she can make things, so I know she'd love this game. I am excited by how simple the game looks. It looks fun and easy for nearly any age. That it's a new way to enjoy my kids favorite toys! I love how you can build your own animal and then take care of it like it's a baby. Thank you!! It's non-violent and it's fun to create an animal buddy! The best part is that its interactive! I heart theres no death or violence. its a good game. thanKs!! Love the cooking like mamma game ! I want to play it too.Forget the kids.LOL. are great way to save money online. Check out coupons from all stores at deals365.us before you shop online.